This was a unique cruiseship, that proved to be in cruiseservice for a very short period of time. She was the first and only SWATH cruiseship in the world. SWATH meaning Small Waterplane Area Twin Hull. The design resembles that of a catamaran, but there are differences and thats why calling this ship a catamaran is not right. The differences are in the design of the hulls-extention in the water. Catamaran hulls are vertically straight and extend down without much variation except at the bow or stern. With a SWATH design, the hull narrows at the water line and then bulges out under the surface. Four stabilizing fins are built within the insides of the two hulls, two on each hull, so the ship gets an enormous stability when sailing. This does not make the ship fast, on the contrary, she only can sail at a speed, when we can call it speed, of 12,5 knots. The ship was built for Diamond Cruise, a conglomerate of several Finnish banks and the UK-based Carlson Group, the owners also of the Radisson chain of hotels. She was built at the Finnyards at Rauma, as yardnumber 310. The ship measures some 18.400 tons and she can sail with up to 345 passengers in 176 cabins. Her crew numbers 177 personsand she has six passengerdecks. These decks did not have actual names, they just read from deck 10 downwards in numbers. The inside design is also very different from other ships, with all cabins at the outside, on decks 7, 8 and 9. Between the cabins, the public spaces were placed, like the lounge and casino at deck 8 and The Club at deck 9. This is kind of the same structure used in most shore-based hotels within the Radisson group. The restaurant was located overlooking the stern at deck 8. Also, the ship feautured an 6-deck high atrium. The lenght of the Radisson Diamond is 131,20 meters, she is 31,96 meters wide and her draft is 8 meters. The ship was launched at the 20th of june 1991 and her first trials were held at the 20th of february 1992 and she was delivered to her owners at the 30th of april of that year. She was leased to Carlson Companies, the parent company of Radisson Cruises and Hotels. This was also the reason why she was named Radisson Diamond at the 28th of may in Greenwich, London. After this, the unique ship sailed some voyages in Europe to introduce herself. After these voyages, she started Caribbean cruising from july 1992 onwards. In 1993, Diamond Cruise and Seven Seas Cruises merged and the new company was called Radisson Seven Seas Cruises. All ships of both companies kept their own names. 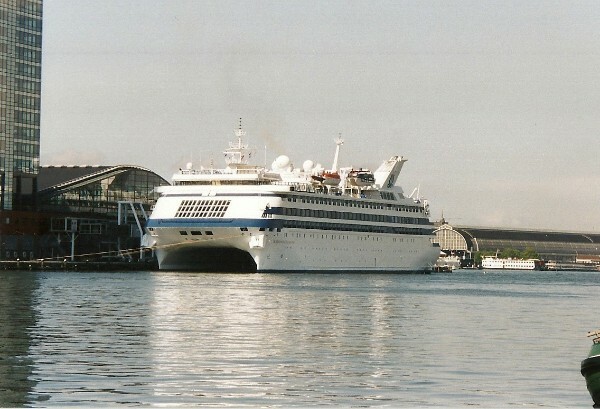 Her cruiseservices ended in 2005, after just 13 years. She was sold to the Conning Shipping company of Stanley Ho, a Macau casino magnate in early 2005, for whom she started sailing casinocruises out of Hong Kong. For this purpose, she was rebuilt extensively from the inside to act as a floating casino. Almost all of her inside venues, with the exception of her main dining room, were rebuilt for gambling purposes. 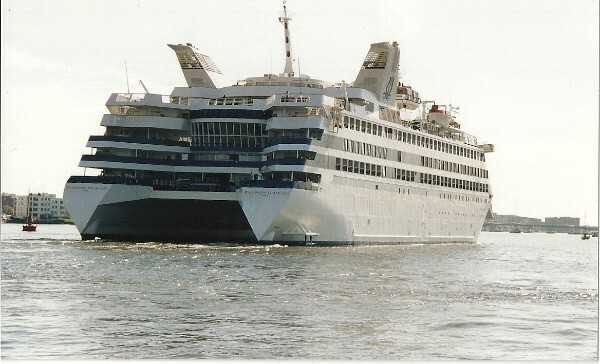 For one month she was named Omar Star, but she was renamed Asia Star and marketed for Asia Cruises from july 2005 onwards. In 2007, her owners were listed as Ocean Treasure Ltd. Because of the economic crisis of recent years, and the opening of many land-based casino's in Hong Kong and Macao, that is already named the eastern Las Vegas, she started cruising from Singapore instead of Hong Kong since 2009. 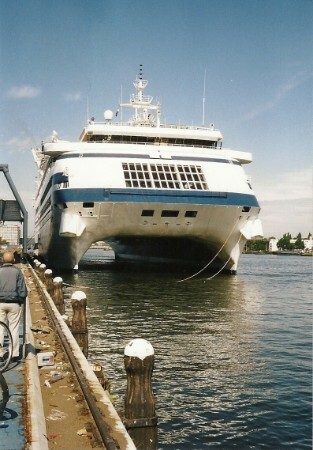 The pictures were taken at one of her few visits to the port of Amsterdam at the 4th of august in 2002.